I am not sure why this tends to be a popular subject for model companies, but it seems that releasing kits of "captured" enemy tanks in German service has become sort of de rigeur. DML has now released this 1/72 gem with a wide variety of options to cover nearly any German service captured T-34 Model 1942 with the "hex nut" turret. One thing DML caught and fixed - and which I missed – on the first release of the T-34 Model 1942 (Kit No. 7266) is the fact that the PT-4 periscope goes on the LEFT side of the turret roof and not the RIGHT side; when only one was provided, it went to the commander and not the loader. (Note that the Model 1942, like the Model 1941 before it, only had a four man crew; the fifth man, a dedicated gunner, did not arrive until the T-34-85 series of tanks.) As a result, a separate new turret roof is included for the basic Model 1942 tank. Another new option with this kit is a choice of four different types of wheels. The kit comes with the standard "steel tired" cast road wheels (8 each, "slide molded" as complete pairs), as well as the earlier rubber-tired "disk" wheels (8 each) and either "six-spoke" (2) or "twelve-spoke" (6) cast wheels with rubber tires. This is provided due to the fact that early on in the Soviet production run of the Model 1942 with all steel wheels it was found to be an incredibly noisy and rough-riding vehicle, and so rubber tires were inserted on at least the front road wheel arms and if possible the rear one as well. By the time the Germans began capturing these tanks in numbers, the wheels tended to be mixed, and the Germans also had to "mix and match" captured material to keep the tanks running. Photos will help select the proper wheel arrangement for a specific vehicle, but if not, as long as you use rubber tired wheels on the first and last road wheel stations you aren't going to be wrong. A complete sprue of Soviet external details is included, and as noted in the review of kit no. 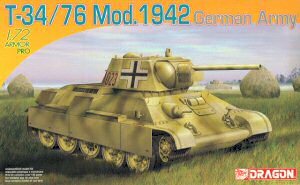 7266 roughly parallels those found in the old Tamiya "Model 1943" kit: rear external fuel tanks, tarpaulins, crates, logs and shovels. The German sprue offers up "Notek" lights, German style OVM tools and add-on stowage bins plus a set of etched brass side skirts. There are two different turret roof arrangements: one uses the Soviet style "Mickey Mouse" hatches and the other uses the Pzkw.III/IV style cupola with a modified loader's hatch. The cupola comes in three to five parts (solid closed hatch or ring with open hatches, upper and lower vision block assemblies) as well as a modified turret roof to mount it on. Since it appears DML will also do a Model 1941 captured tank (at least from the sprues) you will note the hatch cover for one of those tanks on the sprue of German parts. The turret interior does provide the basic components of the F-34 gun, and the barrel is "slide molded" with a hollow bore. The rest of the kit is the basic Model 1942 kit with an extra set of etched brass detail parts, to include not only the rear air exhaust grille but also the intake grilles for the top and sides of the engine deck. Smaller details in brass cover more of the German modifications to the tank. Decals are "targeted" and provide for four captured tanks, two without the German cupola and two with it: 2nd SS Panzer Division "Das Reich," Operation Citadel, Kursk 1943 (no cupola and skirts); 2nd Kompanie, unknown division, Eastern Front 1943 (no cupola); 11th Panzer Regiment, 6th Panzer Division, Russia 1943 (with cupola); and unidentified unit (probably Soviet), Eastern Front 1945. Overall this is a good kit and provides a wide variety of options to the modeler.